Freed to do so by a vote in the British Parliament, Prime Minister Theresa May has just given official notice to the European Union that the United Kingdom is withdrawing its membership. 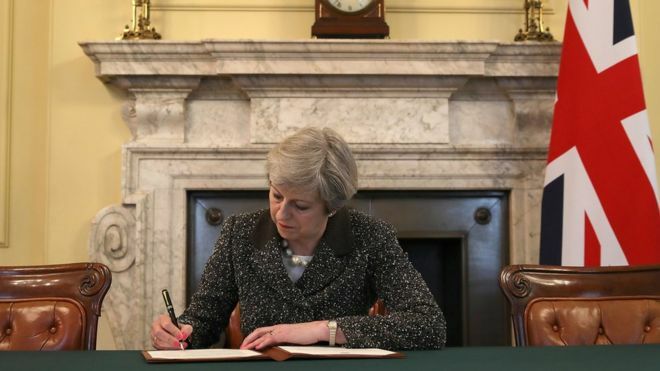 The letter she wrote triggers Article 50 of the Treaty on European Union (TEU). There is no going back now. It is a great day for liberty and a reminder by Almighty God that until the Restrainer is removed, mankind's efforts to undo the judgment at the Tower of Babel will never meet success. When the Restrainer finally is removed, the one world dystopia that the global elites so desperately want will only last for a few years anyway. Their dreams are all for naught. I heard Irvin Baxter declare the Lion was the UK and the Eagle was the U.S. never found anything significant about this. Be very careful and stay away from Irwin Baxter. He has made up his own doctrine and believe that we are in the tribulation because the seals has already been opened.